Middle Georgia State will welcome alumni and the community at large when its first homecoming as a university takes place September 9-12. Activities are scheduled for all five campuses and include an air show, food festival, football game with homecoming court and, in partnership with the Cherry Blossom Festival, the annual Tunes &Balloons. All events are open to the public and most have free admission. The predecessor institutions of what became Middle Georgia State University on July 1, 2015, produced nearly 35,000 alumni. Homecoming is the first of many events the university is planning in order to build community among those graduates and former students. ·3 to 7 p.m. Wednesday,Sept. 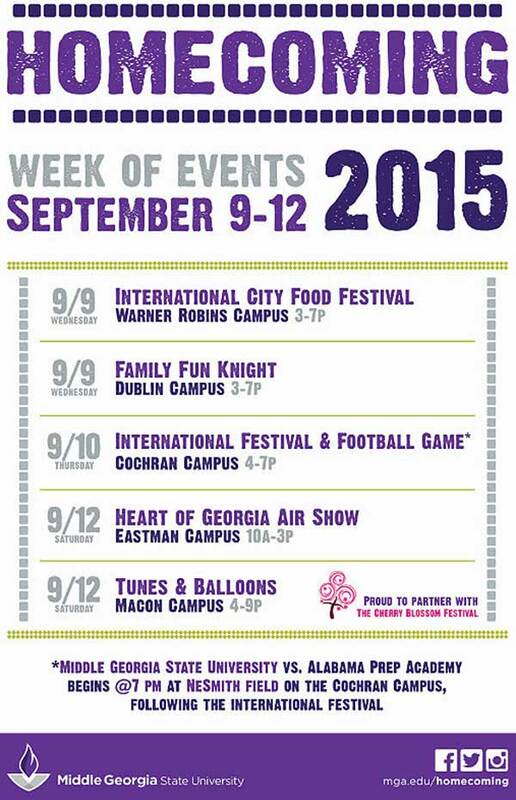 9: International City Food Festival, Warner Robins Campus. ·3 to 7 p.m. Wednesday,Sept. 9: Family Fun Knight, Dublin Campus. ·4 to 7 p.m. Thursday, Sept. 10, Knights International Festival and Football Game with Homecoming Court (game against Alabama Prep begins at 7 p.m. at NeSmith Field), Cochran Campus. For more information about homecoming activities, contact Middle Georgia State University’s Office of Development & Alumni Affairs at(478) 471-2732.